We chose NZ for our first cruise because we wanted to see more of the South Island. The round trip from Melbourne worked out well with same day flights from and back to Perth. 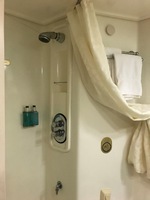 Golden Princess is an older ship but very clean and well maintained with lots of character. The drop-off process for taxis and Uber was quite slow at the Port, we were glad we didn&apos;t have a meter running. Embarkation was good and we could go straight to our cabin. The bags were delivered a short time later so all very easy. 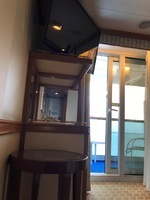 We had a balcony cabin mid-ships on Aloha deck and it was excellent. I&apos;ve read previous reviews about it being noisy near the lifts but the sound-proofing must have been very good because we couldn&apos;t hear a thing except if we were on the balcony. Our cabin steward Raquel was amazing and always around if we needed anything. She would clean and make the bed each morning and then freshen it up again later in the day, leaving ice in the fridge and chocolates on the pillow. The shower was very small but everything worked well. Power points are US with 2 flat pins so Australians need an adapter. If you&apos;re bringing appliances like a hair dryer or straightener they need to work on 110 volts. There are a few bars and drinks are not cheap, around $11-$14 for a glass of wine. You can bring one bottle per person on board for no charge to be consumed in your stateroom, and more but subject to a $15 corkage charge per bottle. A bottle of wine at the bar or dining rooms started at around $41. The drinks package is a ridiculous price at $89 per person! We had (paid) Wifi in our cabin which was convenient but it was so slow that it was almost unusable. So anything more than checking the occasional email is best done when on shore. The Horizon Court buffet was pretty good. We had a couple of delicious curries and often came for dessert or cheese and crackers if we&apos;d eaten at the dining room. The menus at the dining rooms were good but we found the food a little bland, maybe catering to the large number of older people on the cruise (many in their 70s and 80s). Service was very good and we had Any Time Dining and never had to wait for a table. Sometime we shared a larger table and sometimes we chose a table for 2. We did eat at both specialty restaurants, The Crown Grill (steak house) and Sabatini&apos;s Italian. Again the service was very good but the food wasn&apos;t all that special. We are coffee lovers so gave the free (syrup) coffee at the buffet a miss. A coffee card costs $36 for 15 specialty coffees so that was good value. This can be used at the International Cafe or at the bar near the Horizon Court buffet. Our sea days were nice and relaxing and mostly the weather was kind. On the way back to Melbourne we dodged the tail of a cyclone and another system coming up from the south of NZ so there was a bit more movement for one day and one night. They drained the swimming pools which had been making great waves in the swell. We didn&apos;t find it too rough but a few people were feeling a bit unwell. The ports we stopped at in NZ were all great. Dunedin and Tauranga were the stand-outs but we did interesting things at all our stops. The tender service for Akaroa and Gisborne worked well and we never really had to wait long to get off or back on the ship. Entertainment on the ship was a good mix but we didn&apos;t make it to any of the shows. The one we thought we&apos;d go to was already full about 20 minutes before the start time! We liked the Wheelhouse bar and there was often a good guitarist playing. Every morning and afternoon there is a 20 question trivia session which was fun if we were on board. Our only gripe was having to dodge the photographers everywhere, they need to accept that some people don&apos;t want their photo taken every 5 minutes and don&apos;t intend to buy them. They were a bit pushy at times. The Princess Patter (schedule and info for the next day) was delivered to the slot outside our cabin (or sometimes inside if Raquel had been) every evening, usually while we were at dinner. They also have a Princess wifi (this one is free) for information which includes the schedule as well. 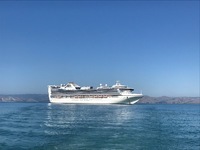 Overall we found the Golden Princess to be very well run with excellent crew and good facilities. We loved the ship and our first cruise. We chose NZ for our first cruise because we wanted to see more of the South Island. The round trip from Melbourne worked out well with same day flights from and back to Perth. 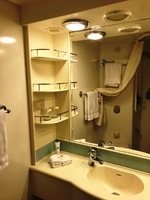 Golden Princess is an older ship but very clean and well maintained with lots of character. The drop-off process for taxis and Uber was quite slow at the Port, we were glad we didn&apos;t have a meter running. Embarkation was good and we could go straight to our cabin. The bags were delivered a short time later so all very easy. We had a balcony cabin mid-ships on Aloha deck and it was excellent. I&apos;ve read previous reviews about it being noisy near the lifts but the sound-proofing must have been very good because we couldn&apos;t hear a thing except if we were on the balcony. Our cabin steward Raquel was amazing and always around if we needed anything. She would clean and make the bed each morning and then freshen it up again later in the day, leaving ice in the fridge and chocolates on the pillow. The shower was very small but everything worked well. Power points are US with 2 flat pins so Australians need an adapter. If you&apos;re bringing appliances like a hair dryer or straightener they need to work on 110 volts. There are a few bars and drinks are not cheap, around $11-$14 for a glass of wine. 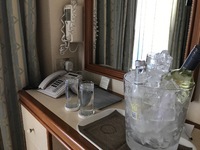 You can bring one bottle per person on board for no charge to be consumed in your stateroom, and more but subject to a $15 corkage charge per bottle. A bottle of wine at the bar or dining rooms started at around $41. The drinks package is a ridiculous price at $89 per person! We had (paid) Wifi in our cabin which was convenient but it was so slow that it was almost unusable. So anything more than checking the occasional email is best done when on shore. The Horizon Court buffet was pretty good. We had a couple of delicious curries and often came for dessert or cheese and crackers if we&apos;d eaten at the dining room. The menus at the dining rooms were good but we found the food a little bland, maybe catering to the large number of older people on the cruise (many in their 70s and 80s). Service was very good and we had Any Time Dining and never had to wait for a table. Sometime we shared a larger table and sometimes we chose a table for 2. We did eat at both specialty restaurants, The Crown Grill (steak house) and Sabatini&apos;s Italian. Again the service was very good but the food wasn&apos;t all that special. We are coffee lovers so gave the free (syrup) coffee at the buffet a miss. A coffee card costs $36 for 15 specialty coffees so that was good value. This can be used at the International Cafe or at the bar near the Horizon Court buffet. Our sea days were nice and relaxing and mostly the weather was kind. On the way back to Melbourne we dodged the tail of a cyclone and another system coming up from the south of NZ so there was a bit more movement for one day and one night. They drained the swimming pools which had been making great waves in the swell. We didn&apos;t find it too rough but a few people were feeling a bit unwell. The ports we stopped at in NZ were all great. Dunedin and Tauranga were the stand-outs but we did interesting things at all our stops. The tender service for Akaroa and Gisborne worked well and we never really had to wait long to get off or back on the ship. Entertainment on the ship was a good mix but we didn&apos;t make it to any of the shows. The one we thought we&apos;d go to was already full about 20 minutes before the start time! We liked the Wheelhouse bar and there was often a good guitarist playing. Every morning and afternoon there is a 20 question trivia session which was fun if we were on board. Our only gripe was having to dodge the photographers everywhere, they need to accept that some people don&apos;t want their photo taken every 5 minutes and don&apos;t intend to buy them. They were a bit pushy at times. The Princess Patter (schedule and info for the next day) was delivered to the slot outside our cabin (or sometimes inside if Raquel had been) every evening, usually while we were at dinner. They also have a Princess wifi (this one is free) for information which includes the schedule as well. 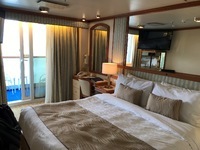 Overall we found the Golden Princess to be very well run with excellent crew and good facilities. We loved the ship and our first cruise. 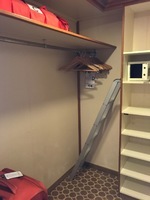 Our cabin had everything we needed, including a large wardrobe with lots of hangars (about 30) and room to store our suitcases. The air-conditioning worked well and we could adjust it as needed. Our balcony had two adjustable deck chairs and a small table and on Aloha deck there is nobody overlooking your balcony. The TV is large and you can take your own movies on USB and plug in. There were a few movie channels on TV which repeated on the same movie all day but there was no TV guide so you didn&apos;t know what time they would start/finish. Also several information and news channels. The bed was comfortable and there were plenty of drawers and storage. We were disappointed in the port area of Auckland. Queen St is all a bit sad with lots of homeless people. We walked around the waterfront looking for a cafe for a coffee mid-morning and couldn&apos;t find anything open. Lots of cafes and restaurants but none of them opened until 11-11.30am (with 2 cruise ships in port)! The grounds and gardens are lovely, we didn&apos;t go inside. Beautiful views. We had lunch at Speights, the food was delicious and the beer and wine very good. Prices are reasonable, highly recommended. The community volunteers at Gisborne were exceptional but there isn&apos;t really enough infrastructure for a cruise-ship visit. Of the many things to do in Rotorua we chose white water rafting (Rotorua Rafting). It was so much fun, we laughed and laughed and managed to stay in the raft. It was very safe and well run, highly recommended. Highly recommended. The Gallipoli display is so life-like and amazing, don&apos;t miss it (and it&apos;s free). Te Papa is a very short walk from the port.